A new triple shaft Model VMC-40S Sanitary VersaMix was recently introduced. 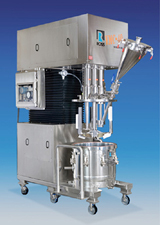 This unique mixer line is designed to provide maximum process flexibility to the user. The VersaMix is constructed using all type 316 stainless steel wetted parts, polished to a 180 grit finish. The unit includes feature such as a self-contained high Shear Rotor Stator Mixer with SLIM for solids induction, a conventional High Speed Disperser, and a Three Wing Anchor with Teflon scrapers to clean the side walls of the vessel. The vessels are jacketed to heat or cool and these can operate to 29-1/2 hg vacuum and 15 psi internal pressure. The mixers and mix vessels are mounted on non-sparking caster wheels making the entire units portable. Models are available from a one gallon bench top design to production sizes exceeding 4000 gallons. Change can and fixed tank designs are offered with features to suit the specific application for which they will be used.